A couple of days after my 34 mile Gritstone Trail run, I decided to set myself the challenge of another long distance run the following weekend. I was curious to find out what long distance runs were at my fingertips in London. My next long race, the Comrades Marathon, is on road, so I decided that this long run should be on road/tarmac. I often find long road runs quite monotonous so I settled on running part of the Thames Path, which I hoped would provide interesting scenery as it meanders through green countryside and into the heart of London. The following Sunday morning, I packed a small day pack and hopped on a train from Waterloo to the end of the line at Shepperton. The train journey lasted just under an hour, past property developments by Battersea power station, out through suburbia, countryside and eventually depositing me at a rather quiet Shepperton. My plan was to run in my old road shoes along the Thames Path, all the way to the centre of London, finishing either by the Millenium Eye or the steps of St Pauls (parodying a scene from ‘Run Fatboy Run’). I’d estimated the route on MapmyRun as being just over 31 miles, and I’d even convinced a couple of friends to join me about 10 miles in. It was a real Spring morning as I set off – a little bit cold due to the clear sky, but with the sun promising to warm me up. There was just a little bit of navigation to get from Shepperton to the south side of the Thames and onto the Thames Path, but from then the route was relatively predictable. Early morning rowers were on the river, and pleasure boats were moored up. The first few miles flew by, and I kept a conservative but consistent pace. 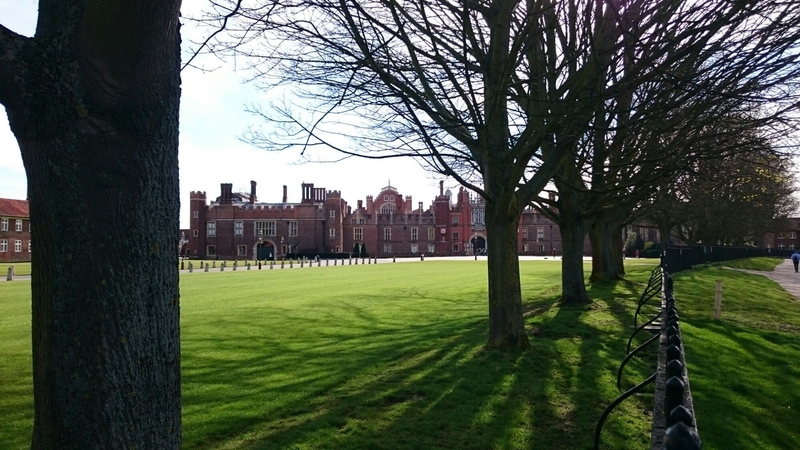 At Hampton Court I crossed back to the north side of the Thames, and was treated to views of Hampton Court Palace and its gardens, then mature park to my left and the Thames to my right until I reached the next bridge to cross to reach Kingston, just under 10 miles in. At Kingston I detoured to the train station to collect a couple of friends who were joining me, then led them back to the Thames Path on the south side of the river (narrowly avoiding a car as I crossed a road without checking left for vehicles turning off the main road). Spirits were high and my friends looked to me to set the pace. I kept the same monotonous pace for miles, allowing us to chat and compare thoughts about running, ultras and nutrition. One of my friends had only completed the Paris marathon the week before, and was still nursing a muscular leg injury. The other had never run more than a half marathon and was eager to hit the 20 mile mark. By 17 miles in, we were in a pretty good pattern, only slowing or stopping to adjust shoes or packs, or to get food or drink in us – it was, after all, a training run. The sun was prominent in the sky, without overpowering us. By twenty miles, my main complaint was my adductors. These are the muscles on the inside of your upper legs, running up to your groin. The repetitive motion of running on flat, even ground did not give them a break, and they started to hurt with every step. Additionally, I was getting thirsty, yet drinking water didn’t seem to help. About twenty four miles in, we were within striking distance of central London. Yet the Thames snakes through the city, and various monuments at different time looked to be on the wrong side of the Thames. Plus there was another power station on the north side of the Thames which briefly had me convinced that someone had moved Battersea Power Station since this morning. Clearly my blood glucose level was not ideal. My feet were starting to get a little sore from the repetitive pounding of the ground, so I made a mental note to buy new insoles, and new trainers! Eventually, my stomach got the better of me and I made a tactical stop at a café to wrench up all the liquids that I’d been drinking. Poor form – and I still have no rational explanation for why I was unable to absorb the liquids. Still, home wasn’t going to get any closer if I stopped so we pushed on. 26 miles in and we were definitely in zones 1-2 of London, and it was comforting being surrounded by increasing number of people. 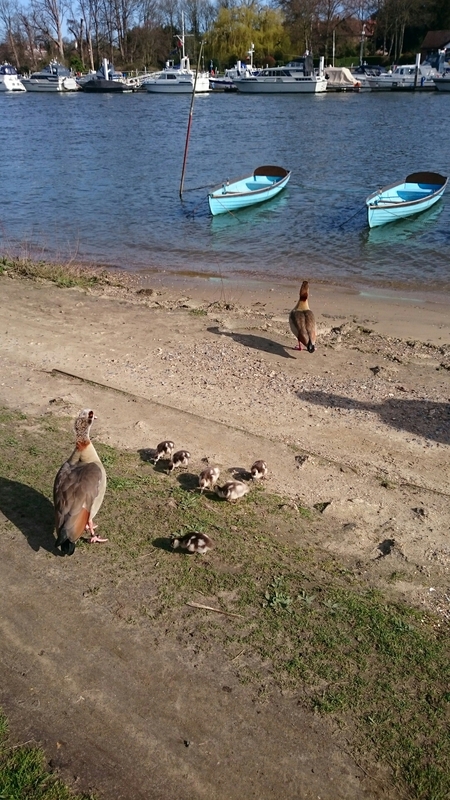 We passed more rowing clubs, and the number of dog walkers increased significantly. The last five miles plodded by, not at a great pace, indeed more of a run walk, as I’d given up drinking to successfully drink water, but knew I wanted to hit the 31 mile mark. Running past the Houses of Parliament, I knew we’d done it, and before we knew it, we were by the London Eye, with my watch reading in excess of 31 miles, and under the time that I’d predicted. 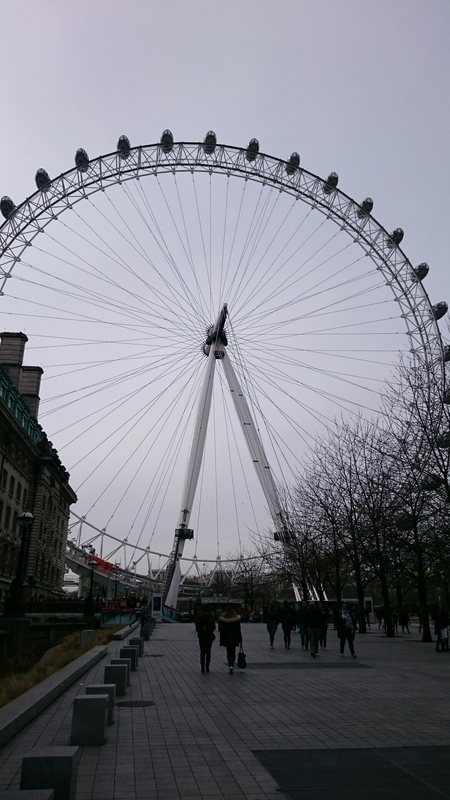 The London Eye – 31 miles done! I felt pleased to hit my intended goal of 31 miles in under the time I’d allocated myself, but was disappointed and confused about my stomach not absorbing the liquids I’d consumed. I had been experimenting with increasing the amount of electrolytes I consume by taking more Saltstick electrolyte capsules – maybe I was reacting to too many of those? Still, the upshot is that I managed to nurse a fruit juice, and soon after that, eat some salty and savoury bar snacks. And then have a beer. And then a huge Indian feast at a popular curry house near Whitechapel, by which point I was feeling much more human and looking back on the long run with rose coloured spectacles. Keep hydrated and keep running!